In the wake of paramilitary violence, this cooperative gave farmers alternatives to the drug trade—and became the beating heart of its rural community. Nestled in the foothills where the Amazon rainforest meets the towering Andes Mountains, the Peruvian town of San Martín de Pangoa exudes an aura of calm. Life seems to move at a leisurely pace; ambling through the town’s mostly-unpaved streets, you’ll see mototaxis rumble slowly past indigenous women cradling their babies in brightly-colored wool blankets. The hills rising above the town are patchworked with a lattice of small farms, and every moto and pickup truck seems to be laden with nearly-bursting sacks of coffee. Today, the people of this farming community can earn a decent living from agriculture. Today, the town is peaceful. But 30 years ago, this idyllic valley looked very, very different. Throughout the 1980s, a conflict between the Peruvian government and a militant group known as the Shining Path tore through the surrounding region. Patrolled constantly by paramilitary groups, the road leading to San Martín de Pangoa became so dangerous that locals referred to it as “el camino donde la vida no vale nada”: the road where life is worth nothing. In the wake of this conflict, agriculture nearly disappeared from the region. But as violence waned, thousands of farmers who had fled their homes in search of safety slowly began to return. Yet without the business infrastructure to get their crops to a larger market, many turned to the only crop that could make them enough money to survive: coca, the plant used to make cocaine. For the 700 farmer-members of the C.A.C. Pangoa cooperative, things were different. They had another choice; they could grow crops that were legal and safe, and that made them just as much money. Much of their success is thanks to one woman: Esperanza Dionisio Castillo. Standing in the small shop where neatly lined shelves proudly display the coffee, cocoa, and honey produced by her cooperative’s farmer-members, Pangoa’s general manager hardly cuts an imposing figure. She speaks softly and carefully. But when she talks, people listen. Watching Esperanza, you know she’s in charge. Doña Esperanza did not coast into this role. She earned it—and as a woman in rural Peru, overcame frustrating obstacles to do so. Closing her eyes for a moment, she recalls one of the first meetings she attended as a cooperative leader. But Esperanza had the business acumen to guide the cooperative out of one of the most challenging times of its history. When she took the helm, Pangoa had been nearly brought to its knees by the Shining Path and the drug trade. Today, the cooperative is Fair Trade- and organic-certified and employs more than 700 people. Under Esperanza’s deft leadership, Pangoa has become the beating heart of its community. Providing alternatives to the drug trade. Raising incomes for smallholder farmers. For many, this would be enough. For Esperanza, it’s just the beginning. Antenor Chimanca Mahuanca, an indigenous cocoa farmer and long-term Pangoa member, concurs. Even as it doubles down on its commitment to environmental sustainability, the cooperative invests in the sustainability of its business by investing in the people who will carry it into the future. That lion is starting to stir. Pangoa sponsors a youth committee that creates space for young people’s participation and development. Ten years ago, Esperanza worked with other cooperative leaders to launch a fund for higher education for its members’ children—many of whom would be the first in their families to go to college. Over five years, she explains, the student receives $10,000 in loans from the cooperative, and then has ten years to pay it back. “The child takes responsibility, which is an important value for our youth.” So far, 27 young people have graduated from university through this program. Year after year, Pangoa produces high-quality coffee, cocoa, and honey at scale. It’s that consistent quality that keeps buyers like Cooperative Coffees and Twin coming back year after year. And it’s what has kept the cooperative afloat through a slew of challenges: crop disease, climate change, and a precipitous drop in the global coffee price, to name a few. But to Esperanza, producing a quality product isn’t the final goal. “The most important thing to me is that the producers don’t need to sell their farms,” she says. “I feel committed to these farmers.”For decades, Pangoa has grown steadily in both its business and its impact. For eleven years, Root Capital has accompanied the business on its growth, providing more than $7 million in cumulative credit. And Pangoa has paid back every cent. That’s $7 million that enabled Pangoa to buy coffee, cocoa, and honey at fair prices from hundreds of farmers, and pay them on time. $7 million that Pangoa has used to change farmers’ lives. 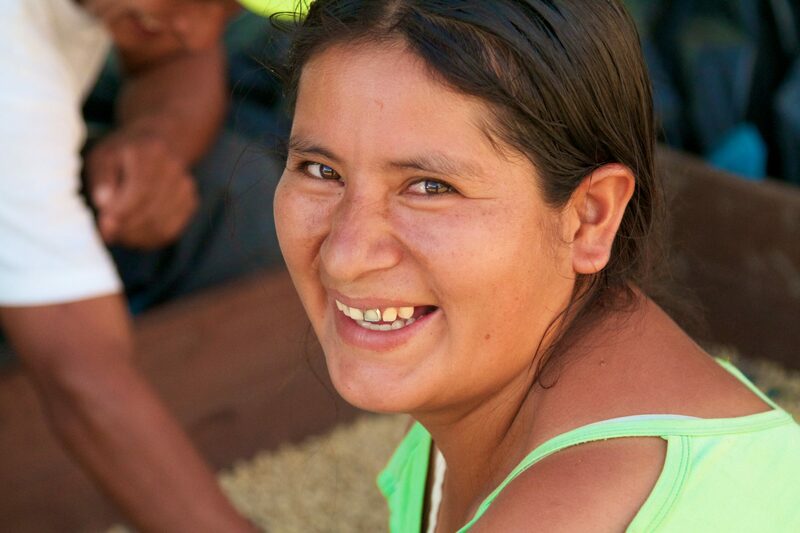 Esperanza and her team are pioneering a model of how agriculture can transform communities. Their vision and determination are exactly what draws us to invest in rural businesses across Latin America, Africa, and Southeast Asia. In these enterprises, we see the same potential for impact that Esperanza saw when she took the helm of Pangoa twenty years ago.